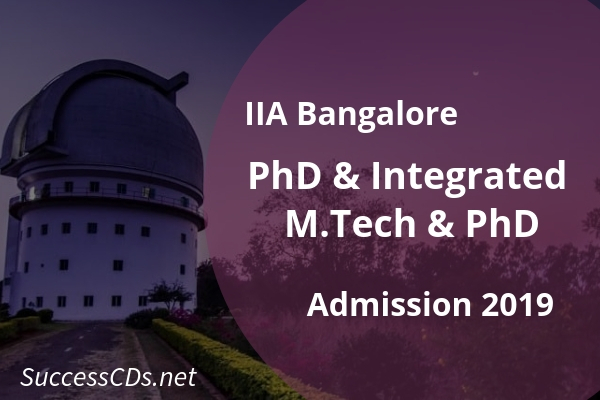 Indian Institute of Astrophysics (IIA) is a premier National Research Institute with head office in Bangalore, Karnataka. IIA Bangalore is recognized as one of the top research institutes in India. It is a DST-funded, research institute, devoted to research in astronomy, astrophysics and related areas of physics. M.Sc. (Physics) / Integrated M.Sc. (Physics) / B.E. / B.Tech. / M.E. / M.Tech. Degree with 60% marks from Standard X onwards. Candidates applying for the IIA-PhD program based on their GATE / JEST score must have qualified in the PHYSICS paper of GATE / JEST. NOTE: Percentile = [(T-R)/T]*100, where T = Total number of candidates, and R = All India Rank. Please refer to the GATE / JEST score card for T & R.
Candidates who have obtained their last degree (qualifying degree) before 2015 are not eligible to apply. For queries please contact: bgs_info@iiap.res.in.